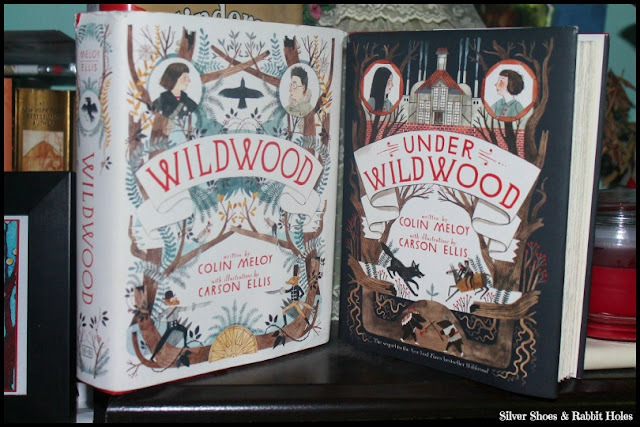 I have just finished reading Under Wildwood, the second book in The Wildwood Chronicles by Colin Meloy. Meloy, as many know, is the lead singer and songwriter for the band The Decemberists, and the wonderful illustrations are provided by his amazing wife, Carson Ellis. Wildwood was a book I was very excited to read. 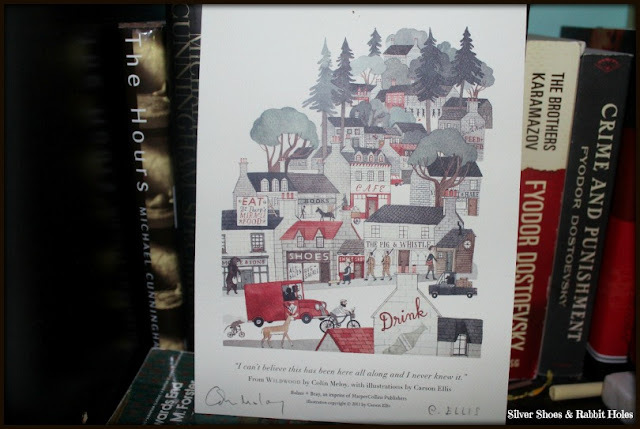 I pre-ordered my copy via HarperCollins' Bookperk website (now on hiatus), because it came with a signed print! A small signed print that I still haven't found a proper home for yet... It hangs out around the living room bookcase, just chillin' with the books. While I liked Wildwood, I must admit I enjoyed this sequel more. It's dark. It leaves you hanging. It's The Empire Strikes Back of The Wildwood Chronicles. If you're unfamiliar with the books, Wildwood is the name of the wildest section of a weird wooded area on the edge of Portland, Oregon called The Impassible Wilderness. In the first book, young Prue finds herself beyond the magical barrier of the woods, chasing a murder of crows who have kidnapped her baby brother. She is followed by a classmate named Curtis. The two have their own adventures in the woods, before joining forces to help the good people - and creatures - of the wood defeat the evil Dowager Governess. I have this overwhelming feeling that I really should read a grown-up book next. I'm becoming a total kids' fantasy geek. My own kids aren't even ready for these yet. So what have I read with the girls this week? 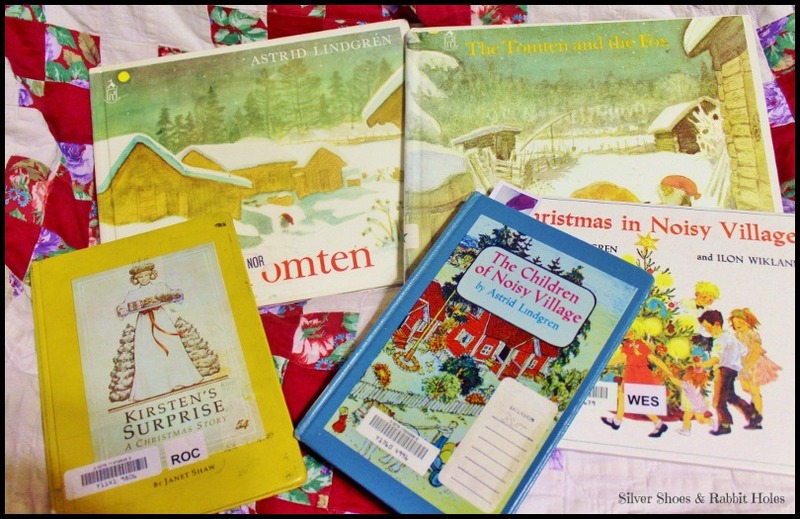 We've been working through our Christmas pile from the library. I put our current "big kid" read, The Wonderful Wizard of Oz, on hold so that I could read The Children of Noisy Village by Astrid Lindgren. This Saturday, my family is finally heading to Lindsborg for the Lucia Festival, which I have wanted to attend for years. Alas, I worked retail for eleven years, and the last few years of that, I was the Saturday morning storytime lady. Asking off was very difficult during the month of December, so we would always sigh and say, "Some other year." Well, this year is that year(!!! ), and I'm making in Scandinavian Week around here! Last night, we started our bedtime reading much earlier than usual, because I had a lot to get through! We read Christmas At Noisy Village, ooohing and aaahing over Ilon Wikland's charming illustration, before reading the Christmas chapter in The Children of Noisy Village. After that, we settled in as I read Kristen's Surprise, the Christmas book in the American Girl Kristen series. Kirsten was the Swedish immigrant doll, from 1854 Minnesota. She was one of the original three dolls, sadly discontinued a few years ago. (My sister bought herself a Samantha doll, also discontinued, back in the day when there were still only three dolls!) Anyhoo, the point is that the Kristen Christmas story is actually a Lucia Day story (December 13! ), and since my girls love their own American Girl dolls (Kit and Molly), I thought this would be a nice day to acquaint them with Lucia Day before our trip to Lindsborg. The American Girl books are actually good. For some reason, they always surprise me. We quite enjoyed Kristen's adventure. Tonight, we have a holiday party to attend, and I know we need to get to bed at a decent time, to be rested for our trip, but I do plan to read The Tomten and The Tomten and the Fox before shut-eye. That is our week in reading. We have a busy weekend planned! I hope everyone has a Very Merry Weekend! I'll leave you with a little Colin Meloy, singing a song he wrote after the birth of his and Carson Ellis's son. Wow, you sure find a lot of cool books! So neat that the guy from the Decemberists wrote it. As per one of your previous recommendations, I took that Gemma Hardy book out from the library for the holidays. Ooo, I hope you love it! Wildwood actually came into the store last year as an Advanced Readers Copy. I'd already ordered it in hardcover, so I left it for someone else. It drove me crazy, though, because I knew I'd have to wait a couple more weeks to read it. I really did prefer the sequel, though. I hope the next book is even better! I've been wanting to read Wildwood for ages and ages -- you are such a good motivator for me! We have Christmas In Noisy Village too and LOOOVED it! So darling! Have fun at that festival thingy! I've been to Portland (it's right under my state!) and it always seems to me just like the show, ha. Haha, Yay! I have some friends who moved there after college (and even more in Seattle! ), and I figured it was pretty accurate. ;o) We still have to finish The Children of Noisy Village. I'm hoping tonight will be it! I have too many books checked out right now! Yay and awesome! And I'm so glad you commented again, because I'm loving your blog, too. I LOVE your Feminist Friday posts! And I'm a big classic country fan. And... my husband and I were checking out your music tonight. LOVE!